Using a 6AU6 as the input stage in the Decimator turned out so well, I thought I'd try it again! I picked up a bunch more 6AU6s real cheap (from a fellow Ampager), and soon after that I was trying to figure out whether an amp built only with 6AU6s would work. In terms of construction, the Pentotron is a cross between the Tonerator & the Decimator. 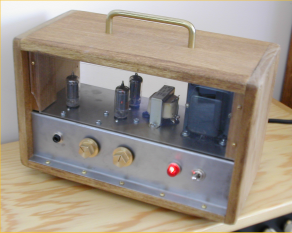 A simple U chassis with ears for screwing it on to the case, and a plexiglass front panel that lets you see the tubes. 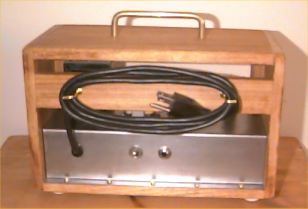 This time I was lazy and just screwed the box together, but it's not exactly so heavy that it needs to be real strong. The wood is 6 x 1/2 poplar with a light oak stain. The cool pentagonal knobs were made for me by my friend & co-worker, David Wegmuller . He makes lots of brass model train stuff from scratch, and accepted the challenge of making the knobs for this project. Thanks, David! I've still got one more "upgrade" planned: a new plexiglass panel with the Harmonic Appliances logo and control labels etched into the back. The Pentotron is a nice little practice amp as-is (especially if you like a "dirty" tone), but I'll probably keep experimenting with it for quite a while, too. These samples were recorded using my '73 Telecaster with Barden pickups. As usual, the microphones were a Shure SM58 and an AKG C1000S (one on each channel). The Pentotron is pushing my Weber C15Q speaker. Copyright © 2002 Mark Lavelle. All rights reserved.